Players of all ages are putting their skills to the test at Keysborough Bowls Club. President Karen Brodie said the club’s oldest player, Ray Woods, was 100 years old. “Ray’s brought a couple of people along and asked me to teach them and they’ve been in their eighties and nineties,” she said. “My four-year-old granddaughter comes along. “It doesn’t matter if you’re good at it or you’re not, you just have a laugh and enjoy it. 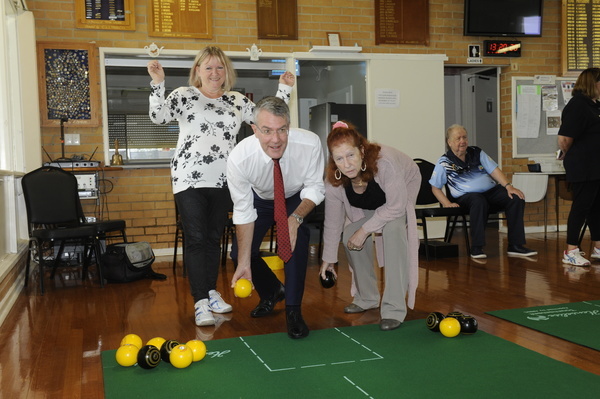 On Tuesday 15 May, the club welcomed Greater Dandenong Councillor Roz Blades and Isaacs MP Mark Dreyfus to try their hand at indoor bowls. Ms Brodie explained that the club received a $4500 Federal Government grant for new tournament mats through Mr Dreyfus, which the club matched. “We play in the Australian nationals. It’s good to have the mats to practice on,” she said. She said the indoor game was very similar to the outdoor equivalent. It’s played on carpet 30 feet long by six feet wide. “The bowls are all one size. You’ve just got to keep the bowl on the mat and get it as close to the white kitty as you can,” Ms Brodie said. “You don’t have to throw it like you do outdoors. Ms Brodie has played bowls for about 23 years. “I’ve played in 10 nationals and won nine medals,” she said. She has several family members involved in the sport, including some who’ve represented Australia. Call Ms Brodie on 0439 867 001 or visit www.keysboroughbowls.com.au to get involved.